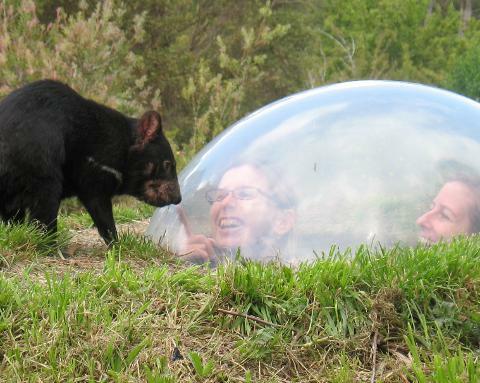 Tasmanian Devil Unzoo is a unique four-in-one wildlife nature experience that combines up-close encounters with Tasmania's special native animals, wildlife adventures, a Tasmanian native garden and original art. The changes are profound: hundreds of trees have been planted and bushland reserves created to provide natural habitats for local wild parrots, pademelons and honeyeaters, boundary fences have been removed to welcome the local wild animals, the whole of the Unzoo is now a Tasmanian native botanic garden with a hundred interesting plant stories and guided walks with high-tech cameras display wild possums hiding in nooks and crannies. Essentially, unlike a “zoo” you will, as Jon Coe planned, be looking up to Nature. So now, after nine long years of development and research, it is time for you to be inspired, intrigued, challenged and entertained. Sometimes, you might even find us a little outrageous. We believe our Unzoo is just the opposite of a caged up “wildlife park” and our hope is that it will challenge you to think about the natural world, and your place in it, in a completely new way.